Paul Joseph Goebbels was born in 1897, to a humble working-class family in the industrial Ruhr region. He had a deformed right leg and for the rest of his life would walk with a slight limp. Because of his leg, Goebbels was refused entry into the military during World War I, a fact that angered him. He had been a bright student so he attended university instead; there Goebbels graduated with a doctorate in romantic literature (he later preferred to be addressed as “Doctor Goebbels”). He also fancied himself as a poet and a novelist but had little success with either; several of his manuscripts were rejected by publishers. In 1924 Goebbels joined the NSDAP, having witnessed – though not been involved in – the Munich putsch. The party put Goebbels’ experience as a writer to use, tasking him to draft pamphlets, editorials and speeches. Sometime around 1925 Goebbels’ efforts brought him to the attention of Hitler, who gave him a lengthy private audience. Goebbels was appointed Gauleiter (party leader) of the Berlin area in 1926, a position of considerable influence. There he was actively involved in organising and provoking street violence against Jews and political opponents. Goebbels also published his own newspaper, Der Angriff (‘The Attack’) and excelled in running Nazi election campaigns, particularly that for Hitler’s tilt at the presidency in 1932. Goebbels also discovered an aptitude for public speaking. In time, he would become the party’s second-most popular orator after Hitler. Goebbels’ style was more relaxed than that of the Fuhrer, for whom he often ‘warmed up’ waiting audiences. His speeches were full of wit, sarcasm and snide observations about party targets, particularly foreigners and Jews. A great deal of Nazi anti-Semitic rhetoric made its first appearance in Goebbels’ speeches. In 1933 Goebbels was appointed Minister of Propaganda and Public Enlightenment. Unlike the propagandists in other totalitarian regimes, Goebbels was very open about his methods and objectives. His speeches and writings often contained Goebbels’ views on the principles and purposes of propaganda. He claimed that propaganda is most effective when controlled and disseminated from one source, such as his ministry; and that good government cannot function without good propaganda, and vice versa. The best propaganda, according to Goebbels, used simple slogans and motifs that could be repeated and learned by the public. It should produce an emotional rather than a rational response; it should enhance the credibility of the government and create anxiety about the ‘enemy’. Goebbels’ ministry was given near-unlimited control of Germany’s communication media, including newspapers, radio and cinema. Through these and other mediums, Nazi propagandists reached into every aspect of German cultural life: news, opinion, drama, music, dance, the visual arts, film-making and architecture. The ministry subsidised radios for German homes, organised free screenings of film and newsreels, sponsored art exhibitions in remote towns, paid for music concerts and dramatic performances in factories. While these projects were usually steeped in Nazi propaganda, they were also popular with ordinary Germans. Goebbels was also instrumental in the organisation of the 1936 Berlin Olympics, which were closely stage-managed and riddled with Nazi propaganda and triumphalism. As war approached in the late 1930s Goebbels’ political influence within the party waned. Though he still enjoyed a measure of Hitler’s confidence, Goebbels was replaced in the fuhrer’s inner circle by men of military importance. Some historians claim that Goebbels ramped up the anti-Semitism in his speeches during this period, in an attempt to regain Hitler’s attention. In November 1938, at a celebration of the 15th anniversary of the Munich putsch, Goebbels misled Hitler by telling him street violence against Jews had broken out in German cities. When Hitler approved of this, Goebbels delivered a radio broadcast which unleashed a three-day campaign of destruction, assault and victimisation of Jews across the entire nation (Kristallnacht). 1. 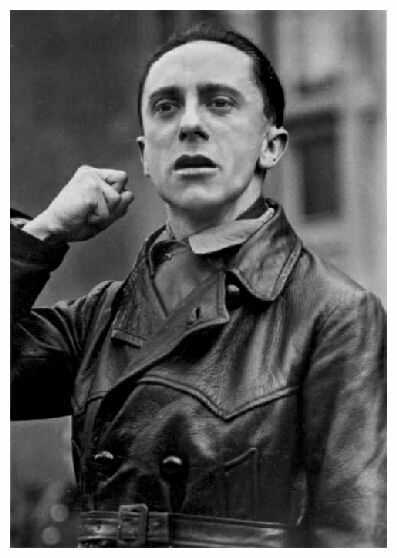 Goebbels was an unlikely Nazi: physically unimpressive, lacking war service, an eager poet and academically qualified. 2. His skills in writing, speaking and disseminating propaganda were vital for the party, a fact recognised by Hitler. 3. Goebbels was appointed party leader of Berlin, where he enjoyed considerable power, organising rallies and violence. 4. He became propaganda minister in 1933 and was instrumental in conveying Nazi ideas across a range of mediums. 5. Goebbels was instrumental in spreading anti-Semitic ideas and sparking the anti-Jewish violence of Kristallnacht. J. Llewellyn et al, “Joseph Goebbels”, Alpha History, accessed [today’s date], https://alphahistory.com/nazigermany/joseph-goebbels/.